Ernan Lopez Nussa is distinguished within the musical sphere as one of the most remarkable pianist throughout the world. Thanks to a rigorous academic formation and very intense professional experience, he has achieved the maturity which is usual among consecrated people. His deep sensitiveness takes root in Cuban and Afrocuban musical traditions, European classics and contemporary music, including all his way of expressions. This allows Ernán in an authentic manner to combine rhythm and beauty, style and lyricism, fusion and purity, which is a real contribution into the Jazz panorama in our days. 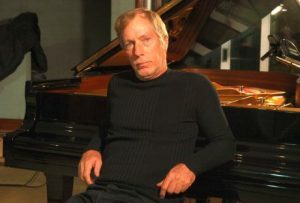 Ernán López Nussa has created works that, because of its melodic richness, harmonic atmosphere, cadence, the charming of its themes and the intelligent use of expressive devices , virtuosity and technique, become unforgettable , and belong already to the Cuban , American and international repertory. Among the stages visited by Ernán López Nussa it could be mentioned the Ronnie Scott’s, London, New Morning, Paris, Chicago Cultural Center, Chicago, Museum of Art, Los Angeles, Teatro Municipal of Rio de Janeiro, Camarín del Carmen , Bogotá, Teresa Carreño, Caracas; Luna Park, Buenos Aires, New Morning, Geneva, Jazz a la Martinique, Fort de France and Fujiyama Jazz Festival, Japan, among others. Countries such as E.U., Spain, Argentina, Uruguay, Italy, Germany, Peru, Surinam, Martinica, Holland, Venezuela, Mexico, Brazil, Greece, Great Britain, Japan and some others have witnessed his unforgettable performances accompanied by a great quartet of young Cuban musicians, who have been also endowed by God’s talent.